According to the Mayan Calendar, we are all hurtling toward inescapable destruction. On December 21, the world will cease to be. What better way to help prevent the apocalypse than to join former NBA player and current Old Spice Champion Dikembe Mutombo in his quest to add more time to the calendar? Three whole levels of 8-bit fun (including fat Dikembe, Random Turkey, and a bear wearing a Cosby sweater) are available now. The latest level has Dikembe creeping through a Hollywood Fat Cat's house in an attempt to prevent another vampire film from being made, all the while flinging Old Spice at disgruntled emo teens who are trying to prevent Dikembe from obliterating their obsession. New levels will be released every Monday as we speed toward the end of times. 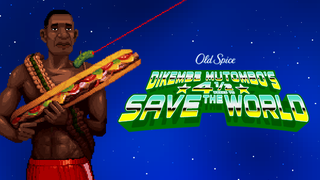 Play Dikembe Mutombo's 4½ Weeks to Save the World now. Help him fling ballots at annoying dancers and crush creepy smiling Blurgies with wagons. Do it. He needs you — the world needs you – to be a champion.